When you walk into a shop, you tend to take everything at face value, but have you ever considered the story behind the shop? No? Neither had I until I went to a Rowan Yarn Flagship Event at Shoreham Knitting & Needlecraft in West Sussex, UK. 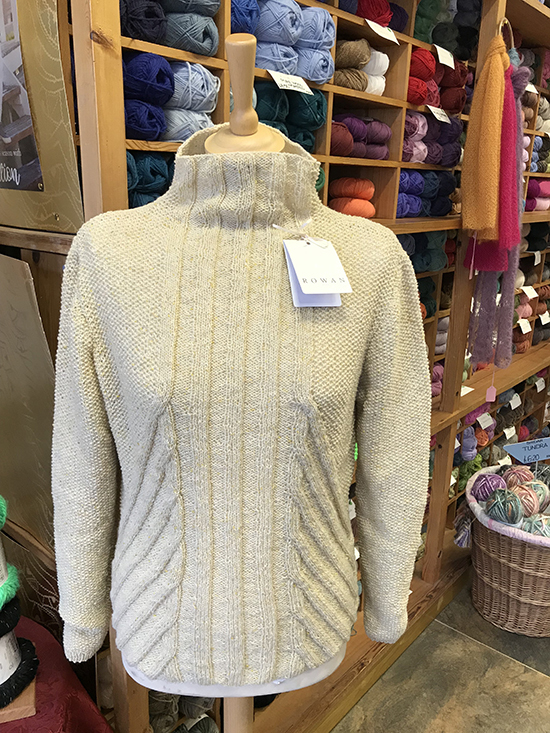 Shoreham Knitting & Needlecraft is a Rowan Flagship shop which means it stocks the full range of Rowan yarns. 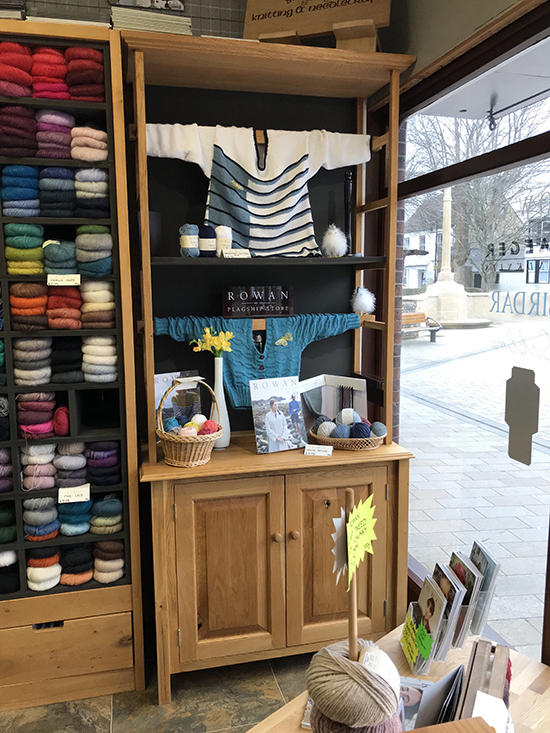 They also stock other yarns such as Sirdar, Jaegar and Regia to name just three and a whole range of knitting accessories, buttons and beads, etc. This is a beautiful yarn shop; a knitter’s dream! Floor to ceiling balls of yarn neatly arranged on wooden shelving and in cubby holes. Cloth lined wicker baskets full of yarn run along the base of this wooden shelving. Knitted cardigans and jumpers adorn mannequins that stand on guard here and there around the shop. I just want to reach out and touch it all before it disappears in front of my eyes! The event itself was great. I chatted with Lisa Richardson who I met a few years ago when Rowan was at Green Lane Mill, Holmfirth. We talked about how busy she was already preparing for the next Autumn/Winter season when she was not deep in conversation with a customer. Charlotte (knitting) and Lisa Richardson talking with a customer. I was introduced to Emma King, Brand Development Specialist for Rowan who had come along to help organise the event and Charlotte who helps Rowan with some of their social media activity. 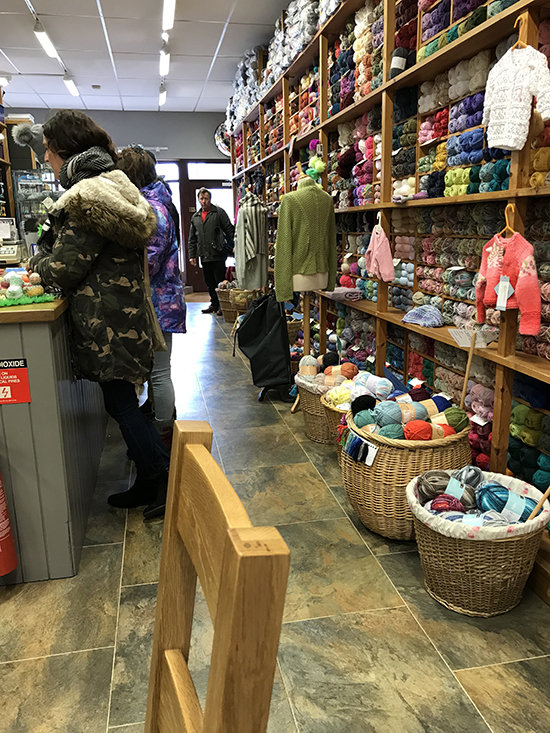 They were all very welcoming and friendly and we sat together with some other customers knitting with the new season’s yarns as we chatted away. The shop was busy with people coming and going. 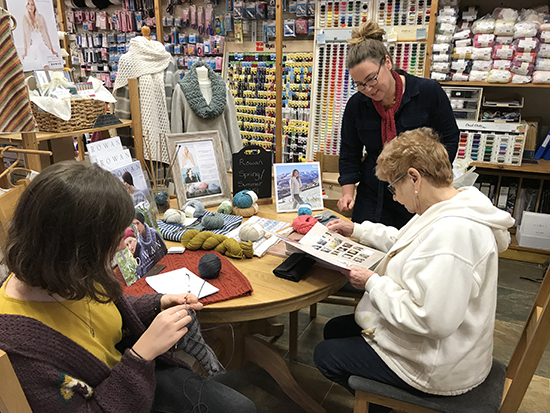 The staff, including Monica, the owner, and Helen, the manager, set about helping people find the correct yarn for a project or even the correct project for some yarn or both! Yes, this is a shop that will help you find what you are looking for. They have hundreds of patterns, probably thousands, but if you are looking for something in particular they will know where to lay their hands on a pattern to suit and the yarn to go with it. I’ve seen it with my own eyes. 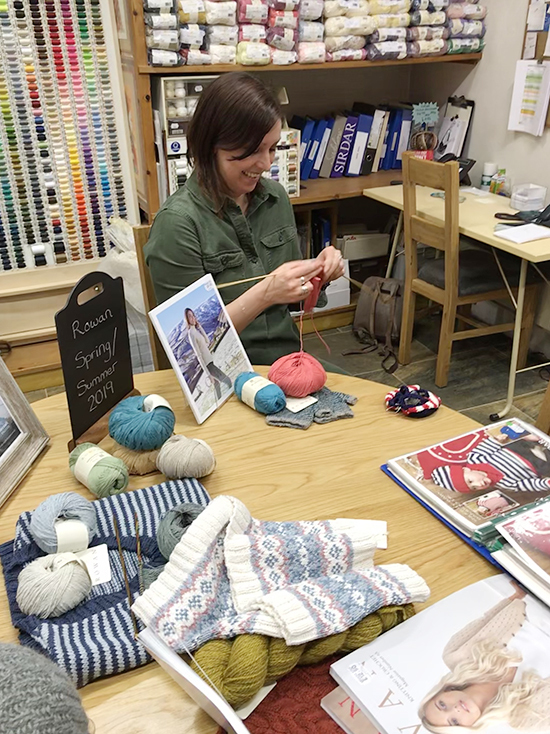 In a quiet moment I was able to sit with Monica and ask her a few questions about the history of her beautifully laid out shop and English Yarns, her online store. 1. 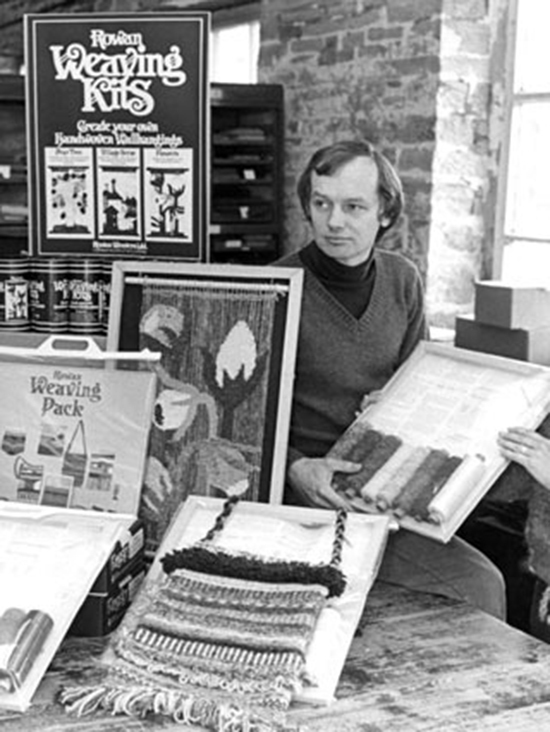 You mentioned that you were the first store to sell Rowan’s yarns: Can you remember when this was? Our first store opened in 1976 and soon after this we started stocking Rowan coned yarn, but can’t remember the exact date. 2. Can you remember why you starting selling Rowan’s yarns? Yes, we were a knitting machine retailer, one of the few in this country at the time. We had started selling Rowan coned yarn and at around that time (cannot remember exactly the year), I met Kaffe Fassett who lectured for two years running at the knitting conventions we used to hold annually. Around this time Kaffe met Stephen Sheard* at a show and this was the beginning of our fascination with Rowan as we moved away from knitting machines to concentrate on handknitting. *(Rowan was founded in August 1978 by Stephen Sheard and Simon Cockin, as a small business called Rowan Weavers. For more information, visit my about page). Stephen Sheard at Green Lane Mill, Holmfirth circa very early 1980s. 3. When did you start selling online? We started in 1997**. Our first customer from New York bought all our remaining stocks of Rowan Designer DK. **(Amazon issued its initial public offering of stock on May 15, 1997, so although online selling was in its infancy, Monica had good foresight to start selling online as early as she did). 4. You mentioned that you helped someone substitute discontinued yarn and shades so they could knit up an old Rowan pattern. Can you remember which pattern? In which country did the customer live? I think you are talking about a customer from Kent who came into the shop originally some 20 years ago. She contacted us again within the last couple of years. The pattern was called ‘Jules’ by Louisa Harding and knitted in Rowan Denim. She tried to substitute with Handknit Cotton, against my advice, and then reverted to Original Denim which was almost the same as ‘Denim’ the yarn used all those years ago. 5. Is this something you do for customers regularly as you still have a good stock of discontinued yarns and shades? (I’m pretty sure that most knitters/crocheters would love to know this). 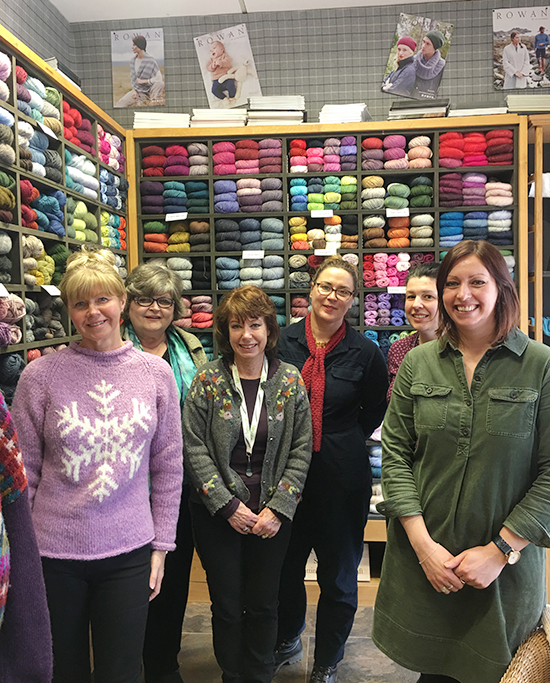 We are always substituting yarns for our customers and with so many years of experience working with Rowan yarns we are one of the few places that can be counted on to help. We do not readily sell off discontinued Rowan yarns believing that knitters collect knitting books and need to know that they can find some, if not all of the yarns and/or shades for their projects some while after they have bought their books. 6. Any other facts that you think might be interesting for me to share? We designed and knitted on knitting machines all the knitwear for the Peter Grimes opera at Glyndebourne in 1992 (not many people, including my present staff, know about this). Amazing! I am so lucky to be living close to this wonderful shop steeped in Rowan history and with its own story to tell! Maybe your local yarn shop has a story to tell too? So next time you go into your LYS maybe there’s a yarn behind the yarn? Do you have a great LYS like Shoreham Knitting & Needlecraft with its own yarn to tell? Please do let me know by clicking on the “Reply” link below.